Karndean International, based in Evesham, is a leading global supplier of commercial and residential luxury vinyl flooring, faithfully reproducing the beauty and look of natural materials such as wood and stone. They operate in a very competitive market place, so control and reduction of overhead costs is a key priority in continuing to deliver the best prices to its customer base. Steve Rundle, one of ERA’s Business Development Managers met with Karndean’s Alan Massey and 11 categories were originally agreed upon – Electricity and Gas, IT Hardware, Fleet, Postage, Couriers, Office Supplies, Packaging, Print (not Media), Merchant Cards and Communications – with a further seven joining them over the next couple of years, assuming results warranted such action – Photocopiers, Inbound Freight, Water/ Wastewater, Business Rates, Insurance, Waste and Recycling, and Facilities Management. 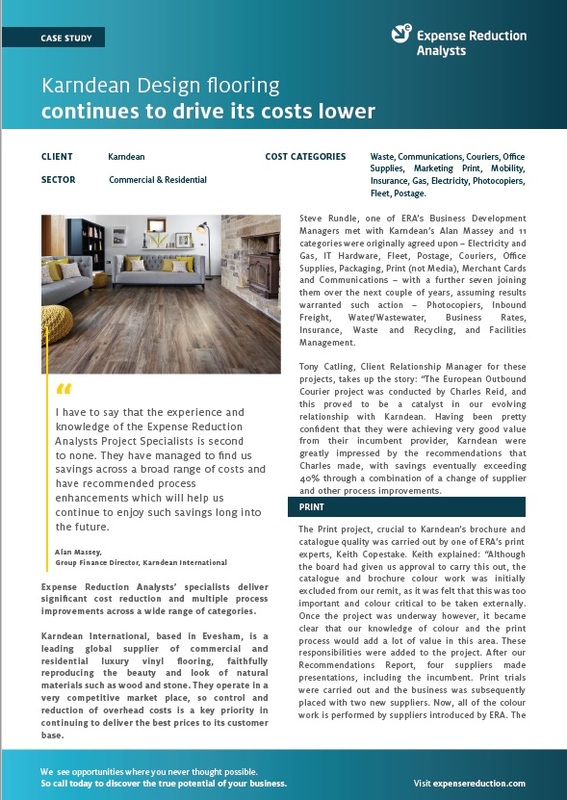 To find out more about how ERA helped Karndean International, including results, savings and more details from the client, download the full case study now.